The bet365 Stadium, previously known as Britannia Stadium, was one of the first newly built modern stadiums of England. It replaced Stoke’s old Victoria Ground, where they had played for 117 years. Construction of the stadium began late 1996 and was completed in time for the 1997-98 season. The first match played at the ground was a Worthington Cup match between Stoke and Rochester on the 27th of August 1997. 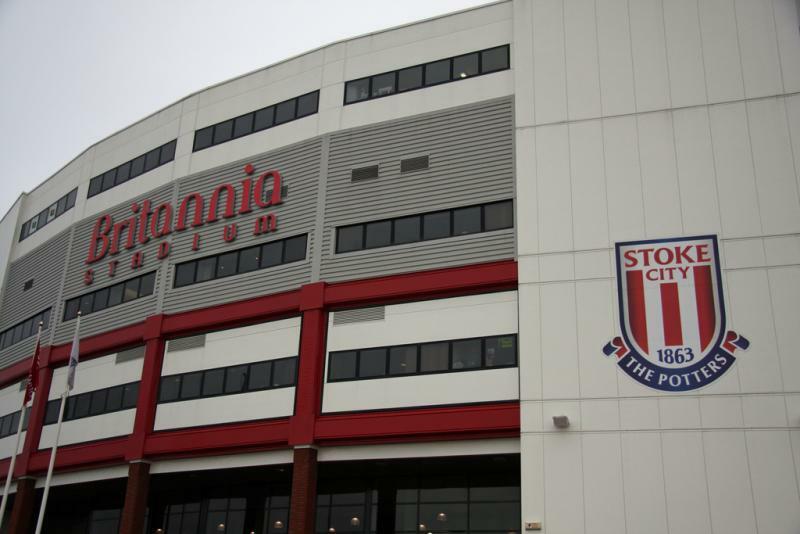 The naming rights of the stadium were sold to the Britannia Building Society as part of a 10 year sponsorship deal, resulting in the name Britannia Stadium. In 2016, a new 6-year naming rights deal was reached with betting firm bet365 resulting in the new name bet365 Stadium. 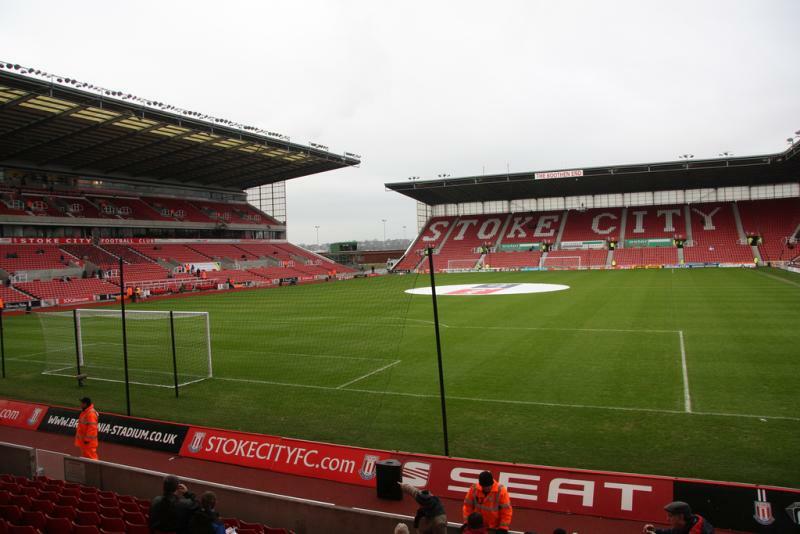 In 2007, the club obtained full ownership rights of the stadium after a £6 million deal with the Stoke-on-Trent city council. The bet365 Stadium is located on an office and retail park in the south of Stoke-on-Trent, almost 2 miles from Stoke-on-Trent Rail Station and about 3 miles from the Hanley shopping and nightlife area. If arriving by car from the M6, take junction 15, then the A500 to Stoke-on-Trent, and next the A50 to Derby/Uttoxeter. From the A50 take the first exit (the stadium is signposted and visible on the right). At the end of the ramp, up the bank, turn right at the traffic lights and again right at the roundabout. 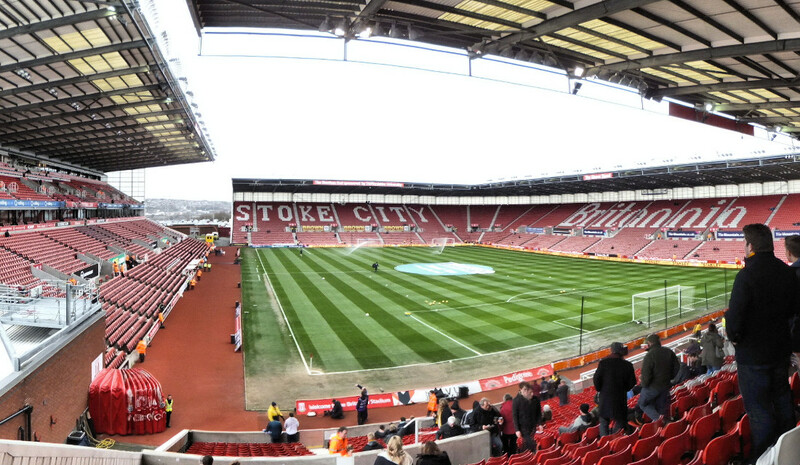 On matchdays shuttle buses run from Stoke-on-Trent Rail Station to the Britannia Stadium. Buses wait on Glebe Street, which is to the right after exiting the station, on the other side of the A500 by the church. On non-matchdays the Wardle Transport PLUM service, and Baker’s Buses line 350/351 connect the stadium with the rail station and Hanley Bus Station. The bet365 Stadium is located on an office and retail park on the edge of the city with, apart from the odd roadside pub/restaurant little around in terms of eating and drinking, which is better done in Hanley or near the main rail station. If you wish to stay the night close to the bet365 Stadium, there is a Holiday Express on the same retail park pretty much next to the stadium. There are few more hotels near Hanley and elsewhere around Stoke-on-Trent, but it’s all very limited and most people will travel in and out for the match while staying elsewhere. Tickets for Stoke City games can be purchased online, by phone +44 (0) 1782 367599, at the ticket office at the stadium, or at the club store at Potteries Shopping Centre (Hanley). If tickets remain available, the ticket office will be opened on the day of the match before kick-off. 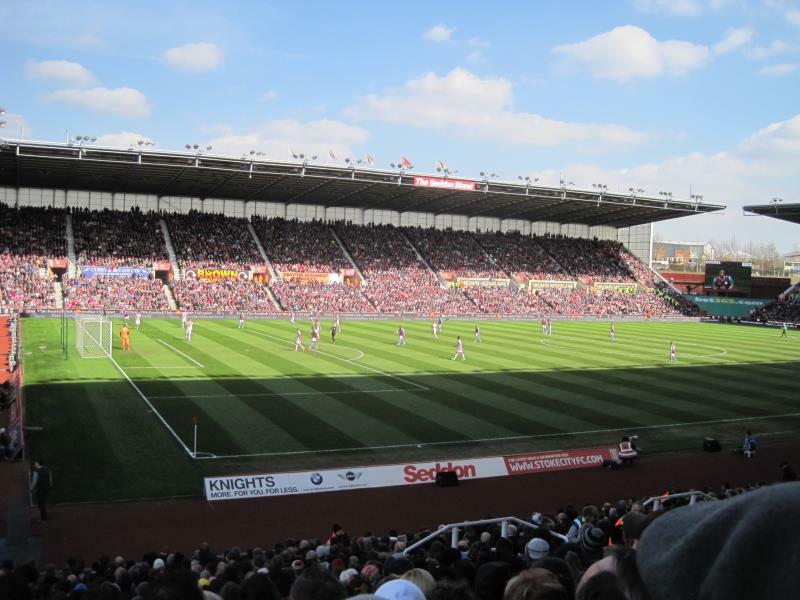 Stoke regularly play for a full house, but tickets for most games are easily available if bought in advance. Stoke matches fall into three pricing categories. Tickets for category B games, the cheapest, cost between £25.00 and £35.00, whereas tickets for category A+ games, the most expensive, range in price from £40.00 to £50.00. Click here for a seating plan. Call +44 (0) 1782 367599 for more information. Stoke run guided stadium tours subject to availability. The tours last about 45 minutes and include a visit to the dressing rooms, executive boxes, and dugouts. Contact community@stokecityfc.co.uk or +44 (0) 1782 592252 for current possibilities and bookings. Stokecityfc.com – Official website of Stoke City FC. VisitStoke.co.uk – Tourist information for Stoke-on-Trent. We were 4 norwegians watching Stoke vs Reading.It was our third time on Brittania.This time we had vip tickets with great treatments from your staff.Lovely food and drinks and great service.Like to say thank you for your hospitality from 4 norwegian lads aged from 54 to 66.